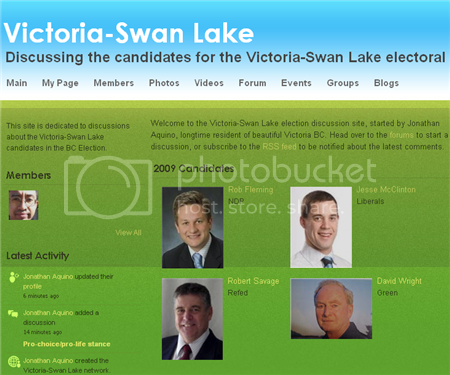 It's election time in British Columbia, so I've created a site devoted to discussing the candidates in my electoral district (Victoria-Swan Lake). I'm trying to get the word out about it, so that my fellow Victorians can join in the discussions. posted by Jonathan at 4/26/2009 12:24:00 a.m.
By potdoll, at 4/26/2009 4:51 a.m.
By potdoll, at 4/26/2009 4:53 a.m.
By potdoll, at 4/26/2009 5:04 a.m.